Order on-line, by telephone, or via purchase order. We also have a range of payment options. Free delivery is available on most UK orders of £75 or more. Got a faulty item? Ordered the wrong colour? We've made our returns policy nice and simple. What you can expect when ordering from this site. All data is collected subject to the General Data Protection Regulation (EU Regulation 2016/679). Address, telephone and email details, along with opening hours. Thermometer Superstore is proud to offer a range of thermometers from Comark, a leading international manufacturer of high quality, precision thermometers and measuring instruments, Comark supply over one million instruments a year to the catering, healthcare, scientific research, laboratories, HVAC and refrigeration sectors. Thermometer Superstore is proud to offer a range of thermometers from Comark Ltd, a leading international manufacturer of high quality, precision thermometers and measuring instruments. Comark supply over one million instruments a year to the catering, healthcare, scientific research, laboratories, HVAC and refrigeration sectors. 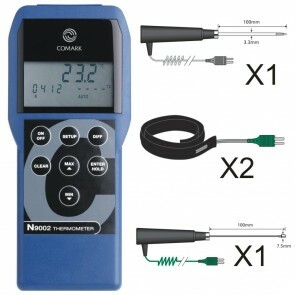 Whilst our online range primarily includes thermometers, dataloggers, probes and humidity meters, as an authorised Comark distributor we are able provide any of the full Comark range on request. Comark instruments are supplied with a minimum of 1 year warranty (6 months for probes) and comply with all the relevant industry standards. All components are manufactured from high quality materials. Buying Comark means you are buying an instrument from an ISO9001 certified company and their instruments are CE marked to show that they comply with European safety regulations. Thermometer Superstore is a trading division of Food Safety Direct Limited. © 2014 Thermometer Superstore. All Rights Reserved.